(*) The case might be important because it comes with a build-in power supply which has some impact on proper ACPI power on/off operation. The build in 140mm front case fan is to be exchanged with 2x 120mm 4-pin PWM fans - I haven't found a 140mm 4-pin PWM fan and also using two 120mm fans gives a better coverage over the 6 disks. One can use the Arctic Cooling 120mm PWM fans as they allow for easy daisy chaining to the single motherboard case fan connector. # any others, break out of the "for" loop. 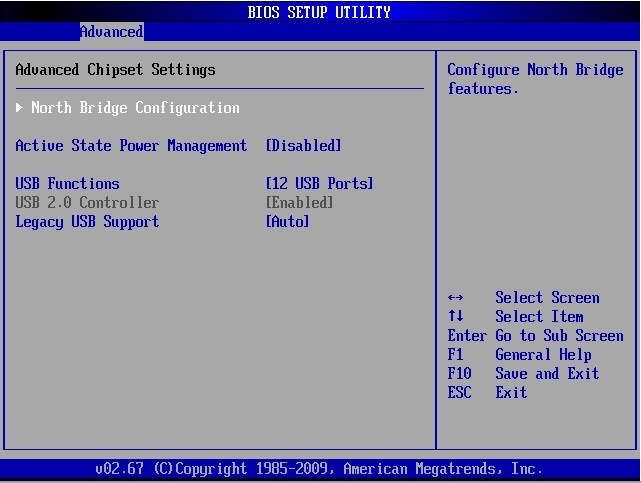 Version is 02.67, attached the ACPI settings. I will post the working scripts shortly. Very interested in the fan script, because while I have lowered the fan speeds during startup in the GO script, I haven't taken the time to write an actual real-time monitoring script. You might also want to link to the main X7SPA-HF thread, and I will add this thread to the first post. Can a mod please jump in and help. Thanks! If you don't get an immediate response, you could just post them into code blocks, unless they're gigantic. When you get resolution from a mod on the upload, you could just edit the first post with the uploaded files. 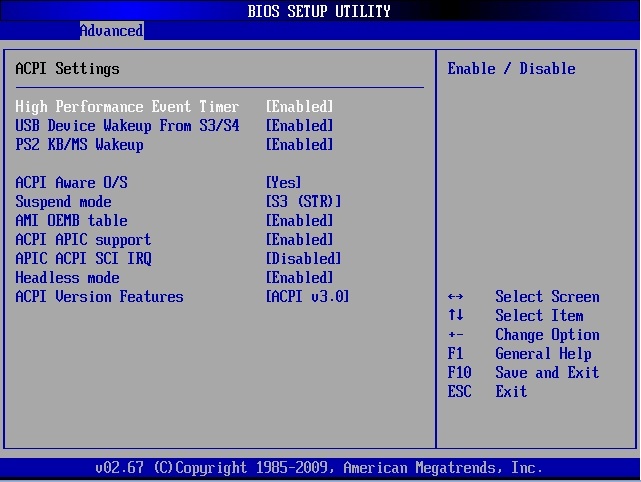 What fan setting do you have the BIOS set for? It defaults to Balanced, which is 50%. I changed mine to Full 100% so that I knew I had accurate speed control through code, without interference from the BIOS. Yeah.. sorry Thought it is best to have everything right on top. We mods don't have any control on the attachment limit. Try zipping up the attachment, or hosting it on pastebin or similar. This is a very nice build. Please post pictures if you have any. I also have one of these boards and I've been trying to figure out what to do with it. My original thought was to build a 20 drive ultra-low power server out of it. But your design is appealing too. By the way, have you run memtest on your board? I tried and memtest refused to run, it would just boot into an empty memtest screen. A bit disconcerting. Memtest is supposed to support the Atom CPU, so I don't know what the issue is. I'm also using RAM off of Supermicro's approved list. Never had a problem with Memtest on mine. So, I hope you don't mind but I modified the script to allow for variable speed control between the FAN_LOW_PWM setting and the FAN_HIGH_PWM. It calculates whole number increment temperature values between FAN_LOW_TEMP and FAN_HIGH_TEMP, then multiplies that increment by the difference in the FAN_LOW_TEMP and the current HIGHEST_TEMP and adds it to the FAN_LOW_PWM value. This allows for variable fan speeds based on 1 degree temp changes, so you don't have to wait for FAN_HIGH_TEMP for the fan to speed up. Obviously, Starcat did all the hard work, I just did a minor tweak. Script moved here. aiden, great tweak, thanks! The original script is based up on xaminder, I customized it for the X7SPA-HF and did some minor mods. Raj, was running full memory test several times without a single glitch. Used 2x 2GB Trancent DDR2 667Mhz and then later 2x 2GB Hynix DDR2 800Mhz, all without problems. Is there a way to make the crontab edit persistent after reboot? I have to add it every time right now. no. It must be added every time. Not wanting to argue, but how does the monthly parity check script get reinserted into the crontab after reboot? Is there a modification I can do to the GO script to make the edit? Btw, what are the measurements of time for "Ticks"? I'm assuming this is where I set my sleep timer, but I'm unsure about how much time it represents. Perhaps you could amend the first post with some explanation as to the mechanics of the S3 script? So a tick is 60 seconds, thus the default sleep timer is set for 10 minutes, correct? It's me again. I've modified the code more to indicate what the previous fan speed setting was, and then eliminated the repeat messages. Having a syslog full of the same alerts every 2 minutes seemed silly to me, since really all I care about are the changes made. I also cleaned up some of the redundant code (repeated statements for each if clause). In response to Starcat's warning, I have also updated the code to check for and ignore drives that are in standby (spun down/sleeping). This allows it to be used with ANY drive, not just the WD EARS. UPDATE 3.17.2011: Add rpm detection to log output. CURRENT_OUTPUT="OFF (0% @ 0 rpm)"
CURRENT_OUTPUT="FULL (100% @ "$CURRENT_FAN_RPM" rpm)"
CURRENT_OUTPUT=$CURRENT_FAN_SPEED" ("$CURRENT_PERCENT_SPEED"% @ "$CURRENT_FAN_RPM" rpm)"
echo "All disk drives are in standby (spundown)"
logger "fan_speed: All disk drives are in standby (spundown)"
echo "Highest disk drive temp is: "$HIGHEST_TEMP"°C"
logger "fan_speed: Highest disk drive temp is: "$HIGHEST_TEMP"°C"
ADJUSTED_OUTPUT=$ADJUSTED_OUTPUT" ("$ADJUSTED_PERCENT_SPEED"% @ "$ADJUSTED_FAN_RPM" rpm)"
Yeap, makes perfect sense. Thanks! Woah! Go figure I just built my first ever unRaid server with this board TODAY! I was getting ready to post a writeup on it and saw this post. Right now I'm pre-clearing 3 brand new 2TB WD WEARS hard drives. One is pre-clearing twice as fast as the other two; is this common? Once these three are ready to go, I have another 2TB and two 1TB hard drives sitting in my gaming computer ready to be copied to the array and then cleared and added into the server case. I went a slightly different route with my case selection. I bought a 4U server case that can hold 15 hard drives (this board can support 14 with an 8 port SuperMicro add in card) and I will have a backup drive ready to go in the case. Nice build! Welcome to the community! There is a detailed thread about the motherboard here, but this thread has some great scripts Starcat has put together, as well as his top notch build. Right now I'm pre-clearing 3 brand new 2TB WD WEARS hard drives. One is pre-clearing twice as fast as the other two; is this common? Well, yes and no. It's not unusual for drives that are exactly the same to have different preclear times. That being said, a two-fold difference is pretty substantial. I forgot to mention I actually have the newer ATOM 525 version. Other than the difference in RAM (DDR3) and clock speed (1.8GHz) I don't think there is any difference. As for the pre-clear time, the two "slow" ones are starting to catch up and they are only about 5% behind now. Smitty2k1, excellent choice of components, congrats! A friend of mine has taken it from Germany.. sorry, not really helpful! Don't use other disks than those WD20EARS as almost all others spin up when smart reading their temp! I have updated the first post respectively. Fixed for all drives in my code here.